BRISTOL - John Ivers was back on the football field for the first time in years. The junior at St. Paul Catholic High School grew up loving the game, but stopped playing in seventh grade because he started suffering consistently from migraines. Ivers, however, returned to the game this past season and was a starting defensive back for the St. Paul Falcons. He plans to play again next season, despite the possibility of future migraines or head injuries in general. That possibility, not only for Ivers, but all football players, has come under increased scrutiny over the past few years, especially with the amount of attention paid to head injuries happening in the National Football League. Most ignore the inherent risks associated with a game that involves hitting on nearly every single play, while others have given up the game because they don’t want to chance having significant damage later in life. Most notably, the dangers of chronic traumatic encephalopathy, or CTE, hit home with the report late last year that Bristol Central graduate Aaron Hernandez suffered the most severe case of CTE ever discovered in a person his age (27 at his death), according to researchers at Boston University. Hernandez played for the New England Patriots before his career ended with his arrest on murder charges. He hanged himself last April in a Massachusetts prison while serving a life sentence for the murder of Odin Lloyd in 2013. While some players retire because of head injuries already suffered or fear of future trauma, there are countless others who decide to keep playing, most never suffering a significant head injury. Ivers believes the life lessons taught in the game of football are invaluable to those that play it and outweigh the risks of CTE. However, more and more of those positives have been overlooked in recent years. CTE, a progressive degenerative disease of the brain found in people with a history of repetitive brain trauma, is a life-altering illness, according to the Boston University CTE Center. It can be a threat to one’s ability to live a normal lifestyle and has been linked to former players taking their own lives. In Hernandez’s case, the researchers said the damage to his brain would have significantly affected his decision-making, judgment and cognition. Ivers’ absence from the game during his first two years of high school was no anomaly, either, as the sport has seen a substantial decrease in participation numbers over past years at the high school level, as the concussion epidemic has sparked nationwide discussion. Overall, the sport saw a 2.5 percent decrease in participation across the country from last year’s numbers to this past fall, just under two individuals per school, according to the National Federation of State High School Associations (NFHS). The state of Connecticut was no exception, as numbers went down as well. In 2016, the state had 143 schools playing football, with 9,573 total players. Both are the lowest numbers since at least 2009. In 2015, the state had 147 schools and 9,842 players. In 2009, the amount of schools was the same, at 147, but the number of players was 950 more than in 2015. In the local area, though, football numbers have remained consistently strong. But that doesn’t mean schools in Bristol, New Britain, Southington, Plainville, Berlin and Newington are ignoring the trends of the game, with the biggest being the need to recognize and treat possible head injuries. Diagnosing head injuries is a priority now for every school. Connecticut football coaches must complete either the Connecticut Concussion Task Force video course, Centers for Disease Control and Prevention (CDC) “Heads Up Concussion in Youth Sports” training course, or the National Federation of State High School Associations (NFHS) concussion training course to hold their job. On the practice field, even more attention is paid to preventing head injuries. The St. Paul football team dedicates a significant proportion of time to teaching proper tackling and blocking technique. During the time allocated to defense in practice, St. Paul does 10 minutes and four station circuits geared toward teaching proper tackling. On offense, the blocking techniques the Falcons teach are based on shoulder blocking as opposed to hand blocking in order to keep the head out of contact. Most of the drills in practice are done against bags rather than teammates, as St. Paul rarely has full contact drills. Bristol Eastern and Bristol Central high schools also take steps in practice to have a safer environment. The Falcons also use neck exercises as a preventative measure. 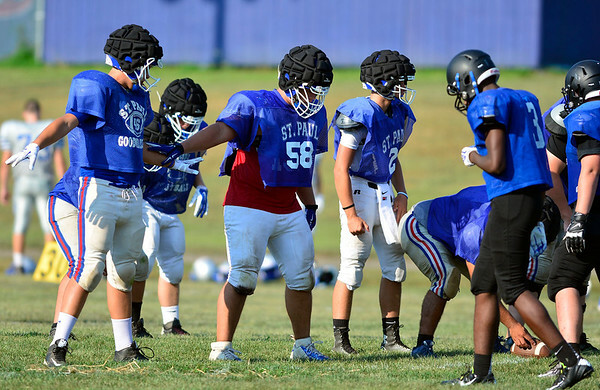 Players are required to do those year round in order to strengthen the neck muscle, which St. Paul football coach Jude Kelly believes reduces movement of the head when struck. The “guardian cap” is a soft attachable cap fastened to the outside of the helmet in order to reduce the impact absorbed when a hit to the head occurs. Staples High School was the first team in the state to use this safety method. At first, the Falcons purchased the caps specifically for players with previous issues with head injuries. The following year every team member wore the cap in practice, and then in 2016, St. Paul used the headgear not only in practice but games as well. This past fall the Falcons elected to not use the headgear in games, only practice. All players in the area also take part in ImPACT and neurocognitive testing before their freshmen and junior years in order to establish a baseline for their functioning. Doing so ensures the coaching staff and trainers know when a player isn’t functioning correctly. Anytime a player shows signs of a head injury, the coaching staff must immediately remove them from the game. In order to return to the field after showing signs of a head injury, a player must go through a process that is required by the CIAC. First, they must be symptom-free. When that criteria is met, they partake in light aerobics, which is followed by sport specific exercises with no contact, then non-contact sport drills before being allowed to participate in full contact sport drills following final medical clearance. Medical clearance is obtained from a licensed health care professional (physician, physician assistant, advanced practice registered nurse, athletic trainer) that is trained in the evaluation and management of concussions. Bristol Eastern and Bristol Central have seen the number of concussions decrease over the years as the time and effort focused on the issue has grown. The CIAC instituted a mandatory bye week as well as limiting contact in practice throughout the week. No contact is allowed in the first week of practice for the season. In weeks 2-3, a maximum of 120 minutes per week of contact is allowed, including one scrimmage per week. For each additional scrimmage, 60 minutes is deducted from that total. In weeks 4-13, a maximum of 90 minutes per week is allowed, with no contract allowed during a team’s bye week. In week 14, 45 minutes of contact is allowed. For Thanksgiving and state tournament games, no contact is allowed during practice. For spring practice, 120 minutes of contact is allowed. While the number of players participating in football is trending down, whether or not that is entirely related to the concussion epidemic is uncertain. For some, it may be; for others, it may not. Also, the number of concussions in football is going to be higher than other sports, just because there are more players participating in the game. With the rule changes being implemented, it’s clear the CIAC and state teams are on board in making the game safer. While it remains up to each program to follow the rules set forth, the game itself has come around to the fact a player’s safety is a focal point. Posted in New Britain Herald, Berlin, Goodwin Tech, New Britain, Newington, Plainville, Southington on Thursday, 1 February 2018 22:54. Updated: Thursday, 1 February 2018 23:22.